Upon opening the received box of product, we are dumbfounded. 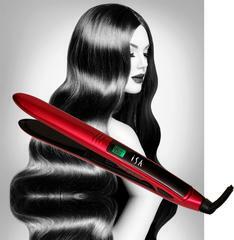 This hair straightener is beautiful. It's beautifully designed and the instructions for use are not verbose, or ridiculous in any manner. The flat iron took less than a minute to heat up. Seriously. We plugged it in. We watched the temperature rise from 110 degrees F to 355 degrees in no time. But, the real impression was noted when we were done. It only took a few swipes to use the product. Afterward, our hair was straight like it hasn't been since we were quite small. Quite small. Good old school photographs will attest to that. We hadn't even brushed our hair for the day. We figured this would help to tell the tale. And, it did. We are straight blown away. We've never used a hair straightener before. Why? This ugly vision came to mind of holding some device close to our precious face for several minutes at a time. Then, we looked into the mirror and horked. This simply did not happen here. isa Professional products may be purchased from the website, as listed below. ISA Professional is dedicated to helping you be your most beautiful. We design and manufacture professional salon quality hair tools. We make flat irons, hair straighteners, hair dryers, hair curlers, organic argan oil, and the XANADU 24K Gold Vitamin C face serum.